Struggling unified comms vendor Avaya has announced a cunning new business strategy consisting of filing for bankruptcy, then rising once more like a phoenix from the flames. The stated reason for opting for Chapter 11 protection is to enable the company to restructure its balance sheet, which seems be another way of saying ‘do something about the crippling amount of debt we’re in’. It is, of course, standard business practice to euphemise frantically when things go wrong, and one person’s restructuring is another’s corporate panic attack. But filing for bankruptcy must surely only ever me a last, desperate course of action taken when all other options have been exhausted. “We have conducted an extensive review of alternatives to address Avaya’s capital structure, and we believe pursuing a restructuring through chapter 11 is the best path forward at this time,” said Kevin Kennedy, CEO of Avaya. “Reducing the company’s current debt through the chapter 11 process will best position all of Avaya’s businesses for future success. “This is a critical step in our ongoing transformation to a successful software and services business. Avaya’s current capital structure is over 10 years old and was put in place to support our business model as a hardware-focused company, which has evolved significantly since that time. Now, as a result of the terms of Avaya’s debt obligations and the upcoming debt maturities, we need to recapitalize the company. So how the hell did Avaya get itself in so much debt? The answer would appear to lie in its acquisition by private equity firms TPG and Silver Lake back in 2007, prior to which it was a public company spun out of Lucent in 2000. Private equity buy-outs often involve a lot of debt and it seems this was no exception. 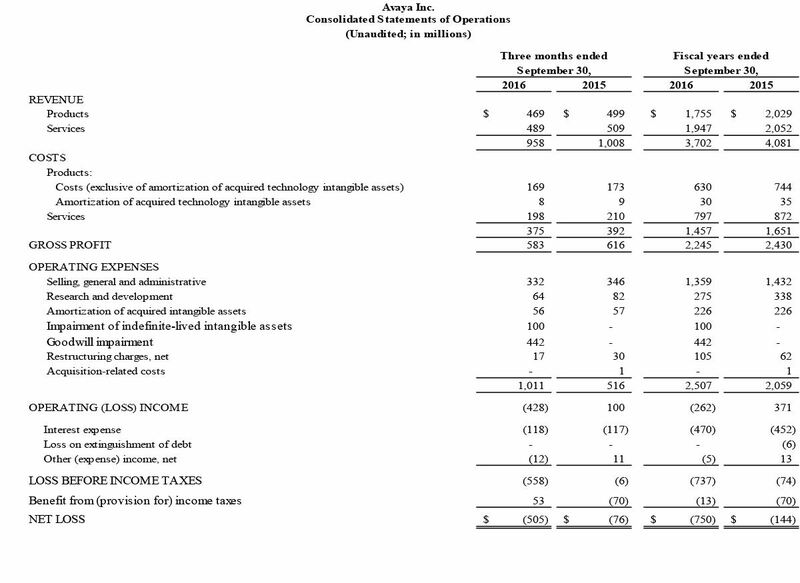 This announcement coincided with Avaya’s Q4/FY 2016 earnings and a look at the P&L below reveals Avaya spent $470 million last year just on servicing interest and it booked a similar amount for ‘goodwill impairment’, which seems to refer to its collapsing hardware business. Removing those two costs would have yielded a profit, rather than $750 million loss. 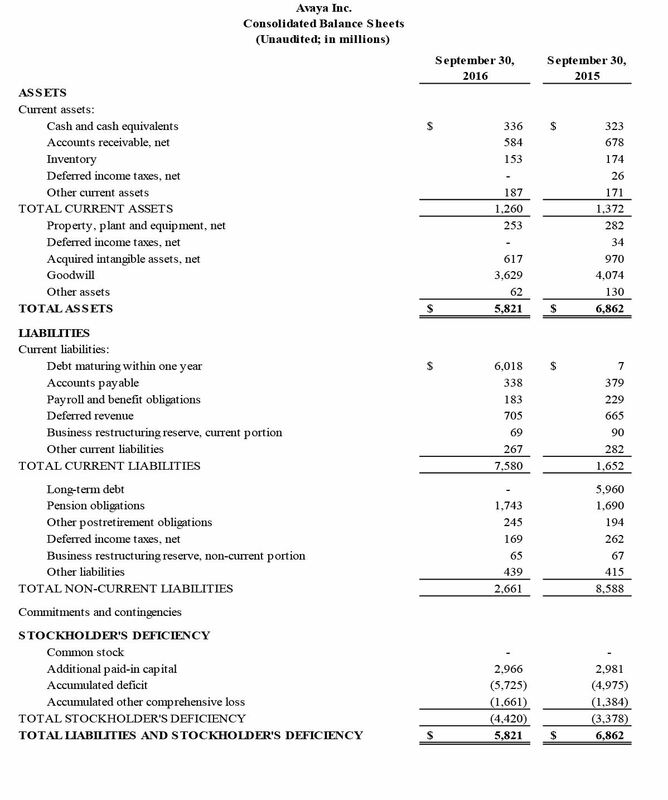 The balance sheet makes for even bleaker reading, revealing a total stockholder deficiency of $5.8 billion, including $6 billion of debt maturing this year and pension liabilities of around $2 billion. The movement of that debt from the long term to the short term column – ten years after the buy-out – seems to be the reason why it’s bankruptcy time. This, presumably, is not how TPG and Silver Lake saw things going when they made their move. A combination of the banking crisis, strong competition from the likes of Cisco and Microsoft, and the decline in demand for UC hardware seem to have been among the unforeseen challenges. Focusing exclusively on software and services seems sensible but presumably even a Chapter 11 filing won’t just magic all that debt away. What about the fact that quarterly revenue has been declining for almost 5 years?? That tells me that Avaya is in trouble beyond the staggering debt load. Avaya seems to be a poorly run company – period. you don’t have to go back that far to when the dot.com bubble burst and the likes of WorldCom, KPN etc. all filed for Chapter 11……they wrote off (sorry re structured) their debt and came back strongly into the market place with disruptive pricing because of it…. around 2000 going Chapter 11 worked for lots of companies…..